I have been hearing so much about how wonderful crochet washcloths are, so I decided to try some out for myself. WOW! Talk about luxury. The soft scrubby feel is just fabulous. I made these from Lion Cotton in fabulous spa colors. Everyone in the family gets their own color and their own stitch. This would be great for a wedding shower gift too - just throw in some fancy spa soap and it's done and done. Or switch the colors up to some fun rainbow ones for a baby shower - add some baby wash, voila! Use 100% cotton yarn - I love Lion Cotton. Nice and absorbent with a great range of colors. Lily Sugar n' Cream would also work nicely for this project. These patterns will make a 10 inch square washcloth. Because this project is just based on a standard measurement, any gauge, any hook, and any yarn weight will work. Chain out 10.25 inches ending with an even number. Row 1: (Dc, sc) in second ch from hook, (sk next ch, (dc, sc) in next ch) repeat across. Row 2: Ch 1, turn, ((dc, sc) in next sc, sk next dc) repeat across. 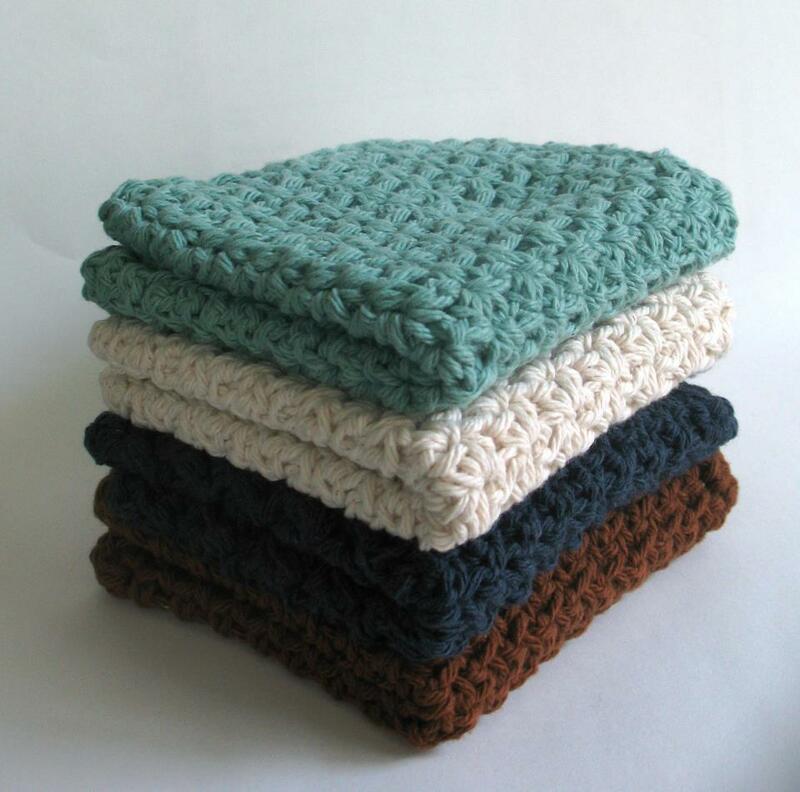 Repeat Row 2 until your washcloth is a ten inch square. Row 1: (Hdc, ch 1, hdc) in second ch from hook, (sk next ch, (hdc, ch 1, hdc) in next ch) repeat across. Row 2: Ch 1, turn, ((hdc, ch 1, hdc) in each ch 1 space across. Row 1: Hdc in 3rd ch from hook, hdc in 2nd ch from hook in front of st just made, (sk next ch, hdc in next ch, hdc in skipped ch in front of hdc just made) repeat across. I know this row is really annoying, but once you get through it the rest is a breeze! Row 2: Ch 1, turn, sk first st, hdc in next st, hdc in skipped st in front of st just made, (sk next st, hdc in next st, hdc in skipped st in front of hdc just made) repeat across. Row 1: Sc in 2nd ch from hook, (ch 1, sk next ch, sc in next ch) repeat across. Row 2: Ch 1, turn, sc in first sc, (sc in next ch 1 space, ch1, sk next sc) repeat across to last st, sc in last st.
Row 3: Ch 1, turn, sc in first sc (ch 1, sk next sc, sc in next ch 1 sp) repeat across to last two stitches, ch 1, sk next sc, sc in last sc. Repeat rows 2 and 3 until your washcloth is a ten inch square. Tip: A trick for figuring out if you're piece is square: fold the piece diagonally, if the sides line up while the corners are touching, then you've got a square, no measuring needed! Want tea towels, dish cloths, or hand towels instead? They measure about 20 in x 30 in. Just increase your initial chain and number of rows to fit the measurements. Thank you for the instructions...my Mom is 88 and needs a change form making quilts all the time...she loves these and will be making as many as I buy her yarn for! Thanks for these simple dish cloth patterns - can't wait to try them out. I tried to make the Hdc pattern and I don't know if it was sleep deprivation or what...I ended up with a curl for my second row. I skipped a stitch, but thought that maybe I wasn't supposed to count the chain 1 space....The picture you have makes them look all the same to me so I just gave up and did another Grit stitch which I love!!! (will be making a baby blanket with this stitch) Can you help me un-dumb myself? Do you mean the shell stitch or the cross over stitch? I just updated the shell stitch pattern a bit to make it more understandable. Hope that helps! The hdc shell stitch just doesn't seem to work the way its written. My second row also turned out wavey. Each row gets larger. Maybe I need some sleep also. I will try to post pictures tomorrow! You should always have the same number of shells in each row so it should not be increasing. What hook size would you recommend when using the Lion Brand cotton? I used an I hook, but really anything in the F to J range should work. Good luck! sure, that would be fine. I just emailed you. Thanks! I just came across the link to these patterns on Ravelry and I am so excited to try them! I also love the fact that you listed dimensions for tea towels and washcloths. Sometimes I need a working parameter first before taking off on my own and yours has the simplest explanation I've found!! Wonderful! Glad you like it. In the Granite pattern it should read sc in 2nd ch from hook, (ch1, sk next ch, sc in next ch), repeat across. This will cure the wavy problem. Happy holidays! Right you are!!! Can't believe that this wasn't caught sooner. Do you have more pictures of the washcloths? There's a ton of them!